CD review: "For All I Care"
This review first appeared in Turbula in April 2009. 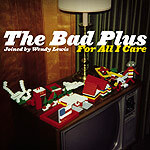 Not even the addition of vocalist Wendy Lewis on their latest disc is enough to lift the cloud of suspicion that we've heard all this before from The Bad Plus. What was once a charming idiosyncrasy is starting to become strait-laced formula  hearing the young jazz trio turn rock touchstones like Nirvana's "Smells Like Teen Spirit" or Blondie's "Heart of Glass" inside out into atonal dissonant avant-garde numbers was an exciting bit of musical liberation six years ago. But after hearing Ethan Iverson (keyboards), Reid Anderson (bass) and David King (drums) spend the intervening years reworking everything from Queen's "We Are the Champions" to Black Sabbath's "Iron Man," the novelty is wearing off  particularly as all their covers of rock songs seem to work from the same template: Iverson slowly, erratically picking out the hit song's familiar theme on piano before Anderson and King come in with some weird off-kilter rhythmic pattern, building up to an over-loud crescendo, then slowly winding down. Here, they don't give us the two covers previous albums have, they indulge their (and) our love of all things familiar with an all-cover set: "Lithium" (Nirvana), "Comfortably Numb" (Pink Floyd), "Long Distance Runaround" (Yes), "How Deep Is Your Love" (Bee Gees) and "Barracuda" (Heart) are just the most familiar. And even though they break their own formula by having Iverson open many of these songs in straight-ahead fashion, sticking close to the original (particularly when Lewis is singing), it just seems a bit tired. The band's playing remains virtuosic, and Lewis is their equal on vocals. But the Bad Plus risks becoming a bit like Cake  the talented Bay Area geek rock combo that got so locked into its formula of sardonic humor that after a while, there was no way to escape that expectation. It's not too late for the Bad Plus: Here's hoping the next album veers away from the rock covers and into something fresh and new.